Probably the most famous documented quote from five-time Tour de France winner, Bernard Hinault. 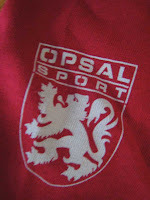 I received the very nice Opsal Sport t-shirt from my brother as a birthday gift. The badger was respected and most of all... feared by many riders for his volatile temperament. Often appearing arrogant to the cycling public, he once said, "I race to win, not to please people." Truly individualistic and one of the great Tour heroes! 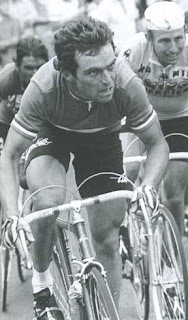 His first win; the 1978 Tour de France. The badger turns on the screws against; (l to r) Agostinho & Zoetemelk. Shoulder detail proudly displaying the Flandrian Lion! Love him or hate him, the Badger was somehow larger than life -- he felt like someone from another planet or another time; like Cyrille Guimard had shaved a medieval Breton yeoman and taught him how to ride a bike. Yesterday I was riding up the Trinity Road climb, which has featured in both the old Coors Classic and the new Tour of California. I was thinking of all the greats who had raced up that climb over the years -- Lemond, Argentin, Bettini, Bauer, Anderson, Boonen -- but all this was dwarfed by the thought that Hinault Had Ridden Here. HIM? HERE? In California? It's like hearing that Beowulf or Rasputin or Caesar camped out in your back yard once. Yes. 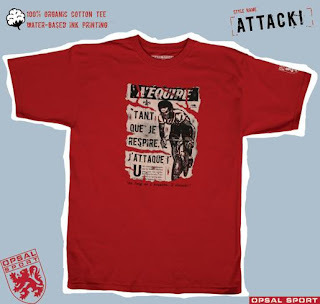 Hinault can belong in another era. Just place a sword in his hands and he would be the same. A true fighter!